The British A1E Independent Tank was a heavy tank that had multiple turrets with a main gun and machine guns. The design proved troublesome for the vehicle commander to manage the other 7 crew members despite an internal intercom. 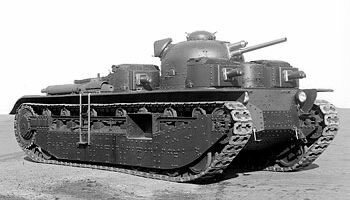 Vickers built one prototype in 1925 and though similar laid out tanks were manufactured in small numbers in other countries, the British Army did not adopt the vehicle.